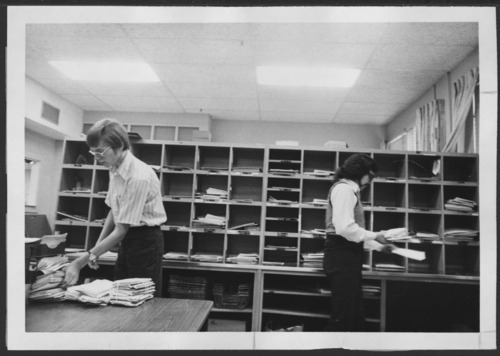 Randy Ripple and Mike Munoz are shown sorting mail at the Menninger Clinic. Dr. C.F. Menninger and his sons, Dr. Karl and Dr. Will, formed a group psychiatry practice in 1919. The Menninger Clinic as a sanitarium was established in 1925 with the purchase of a farm house and admittance of 12 patients. The philosophy was that mental illness could be treated with an integrated medical, psychodynamic, and developmental approach for the total health of patients.